I stumbled across this review I wrote last year while browsing through my drafts, so I decided to publish it as my first "Playing Catch-up" review. These are reviews of older games that I only got around to playing a fair while after their release, or re-reviews of games that have changed greatly since I've previously covered them. Prince of Persia is Ubisoft's attempt to reboot their popular platformer franchise in order to appeal to a wider audience. The stilted and punishing platforming segments of the previous trilogy has been removed in favor of smooth acrobatics and very forgiving gameplay. And even the combat has been revamped to see less generic mob-bashing and more engaging fights against powerful and imposing creatures. But the most obvious departure from previous games in the franchise is the introduction of a sidekick, Elika. This 'princess' aids the new Prince in his adventure as they both set out to rid Elika's lands of the corruption caused by an escaped evil known as Ahriman. And she's far more than just a random AI-driven hanger-on, as the Prince is regularly forced to rely on Elika in both acrobatics and combat. The cell-shaded graphics and captivating background music support this adventure beautifully and arm the game with a decidedly charming look and feel. It's certainly not the most technically advanced game of its time, but the epic scale of the environments and the beautiful sprawling vistas of healed regions combine to form a game that's truly pleasing to the eye. No moment makes this more abundantly clear than when Elika first heals an area of Ahriman's corruption. The surrounding land undergoes a transformation from bleak and downtrodden to colorful and green. And this transformation also opens up new paths through the environment, which are needed in order to advance to different areas and to collect light seeds. These light seeds are used to purchase special powers for Elika, which in turn unlock new regions. These powers are activated by reaching specific touch stones in the environment and include flying through the area while dodging obstacles or making magical leaps towards other parts of the level. It's a welcome touch that further drives home how much these two have to rely on each other, but the collection of these light seeds gets very repetitive. More than 500 such light seeds are required in order to reach the final chapters of the game. The combination of Elika and the Prince makes for some very wild acrobatic sequences that are surprisingly easy to control. Only a handful of buttons are required to play the game and this results in simple acrobatics that flow more smoothly than ever seen before in a platform game. This allows more time for admiring the spectacular acrobatic sequences and impressive world design, but does remove some of the challenge. That may have been a worthwhile trade to make had Ubisoft Montreal not taken things one step too far by making it impossible to die. Should the Prince fall to his doom then Elika is there to save him from certain death and magically transport him back to the last stable platform. The same is true in combat, where Elika interjects herself whenever the Prince is about to receive a mortal blow. But combat remains interesting nonetheless as it differs greatly from the previous trilogy. Prince of Persia involves intense one-on-one fights with a number of different attack moves used to blast through the opponent's defenses. The wrong move will have the AI quickly take advantage of your mistake, while correct moves can be chained into powerful combo attacks that combine the Prince's martial expertise with Elika's magical prowess. And the enemies are also interesting as they use very different techniques to challenge the player. One opponent can't be harmed by ordinary attacks for example, but has to be pushed into obstacles that then collapse in on the hulking behemoth. Another fight involves a fast and cunning swordsman who is a definite match for the Prince in power and agility. This all makes Prince of Persia's combat a welcome improvement over the previous games, but one that's severely hampered by the impossibility of failure. Storytelling may never have been a strong point of the series, but this iteration holds up surprisingly well in that regard. Its basic premise may be fairly generic, but Prince of Persia comes with some interesting plot twists towards the end and Elika forms a truly interesting and appealing character. Ubisoft Montreal should also be applauded for offerings evil minions that have actual stories and personalities. But none of that praise can be reserved for the Prince, who is a singularly annoying character that regularly made me wish that dieing was an option. It would have been immeassurably satisfying to see that arrogant one-liner factory plummit to his doom, over and over again. To make matters worse, it often seems as if the Prince is far more reliant on Elika than the other way around, which doesn't quite sit well when the Prince is the actual playable character. 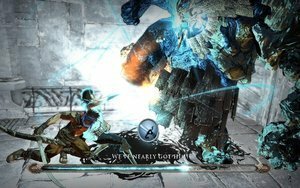 Most of the exposition occurs during cutscenes or combat, but these combat sequences are frequently interrupted by standard combat phrases from Elika and the Prince. The subtitles aren't of any help either, because combat phrases replace those as well. Fortunately it's also possible to chat up Elika whenever you're not hopping around the terrain or disposing of bad guys. And she also offers some additional exposition on the background of the world, Elika and the demons you're facing. Despite the simplistic gameplay and impossibility of death, Prince of Persia still offers well over a dozen hours of gameplay at bare minimum. 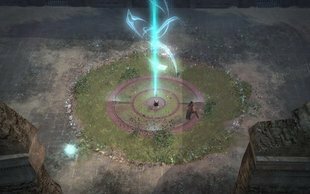 Elika's regularly unlocked powers ensure that the acrobatics don't get too repetitive towards the end, while combat remains interesting because each encounter is different from the next. But repetition does manage to seep in with the inane collection of light seeds and constant running back and forth between areas already covered. The result is a game that embraces the experience it has to offer and presents it in the most accessible manner possible. After looking past this overly simplistic approach to the genre it's a truly entertaining and at times stunning game. But those looking for more of a game than an experience will be left disappointed.